The Advanced Child Development course this spring is co-taught by visiting scholar Esa Alaraudanjoki and professor Debbie Stiles. This spring the School of Education hosts a visiting international scholar in school psychology. Esa Alaraudanjoki is a school psychologist and clinical psychologist from Finland with a broad international background in child development on multiple continents. 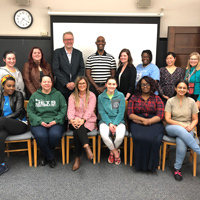 That background resonates with his students in an Advanced Child Development course that includes Webster graduate students from six different countries. Alaraudanjoki is co-teaching that course with Debbie Stiles, professor and director of Applied Educational Psychology, School Psychology, and Intercultural Research Center. Students in the class are originally from Bosnia, Haiti, India, South Korea, United States and Venezuela. "I believe that Advanced Child Development is the most diverse class I have ever taken, and I am learning so much from various perspectives from multiple cultures," said Centron Felder, a graduate student in the course. Alaraudanjoki has a master’s degree in human rights and a doctorate in psychology. His dissertation was on a child rights topic: he compared Nepalese children who worked in the carpet industry with Nepalese children who were in school. He studied their intellectual development, well being, and mental health. Throughout his career as a psychologist, Alaraudanjoki has continued to advocate for child rights and he also works with organizations such as Plan Finland. He was previously a visiting scholar at the University of Cambridge in the United Kingdom and the University of Geneva in Switzerland.